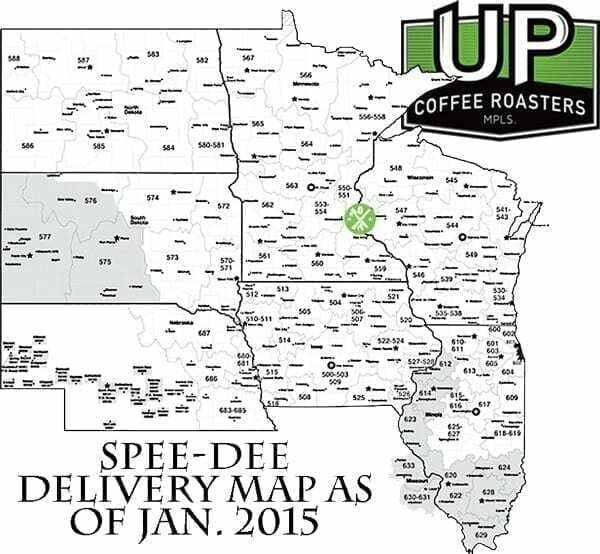 Spee-Dee Delivery Service: Next day shipping/handling with no minimums through Spee-Dee Delivery Service available for customers in North Dakota, South Dakota, Nebraska, Minnesota, Iowa, Wisconsin, & Illinois. 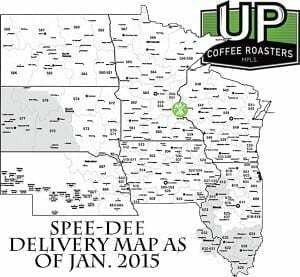 We offer free S/H on any order of $600 or more to anywhere in our Spee-Dee Delivery territory. FedEx Ground: All orders placed by customers outside of the Spee-Dee Delivery territory will be shipped using FedEx Ground Shipping unless requested otherwise. Freight/Pallet shipping is also available. Local Delivery Van: We offer local delivery for Minnesota Metro Area (Minneapolis, St. Paul, and surrounding suburbs). There is a $175 minimum order and $4 fuel surcharge on all local deliveries. Local delivery day are Tuesdays (East of river) and Thursdays (West of river). Will Call or Pick Up: Orders may be picked up anytime at UP, free of charge Mon-Thurs 8am-5pm and Fri 9am-1pm. 1) Call the office at (612)728-7208 and place your order with one of our friendly employees. 2) Go to http://upcoffeeroasters.com/about/wholesale-order place your order using our online Order Form. 3) Call or e-mail your regional sales manager and request to be put on a weekly or monthly ordering call list. PAYMENT POLICY: UP Coffee Roasters accepts all major credit cards, online check payments via Intuit Payment Network (IPN), or COD (COD fees may apply). UP COFFEE ROASTERS RETURN POLICY: All orders that are in the original packaging and unopened can be returned within 7 days for a full refund less shipping fees. Anything beyond 7 days or without the original packaging is subject to a 15% restocking fee. No opened product can be returned (food seal, not box). Returns that affected $600+ free shipping program will be credited less the cost of what the original shipping would have been had order not hit $600. Exceptions include special event programs where large volume needs to be ordered to cover event. Product for special events must be returned within 4 days of event end. We will work with you on filing claims on product that arrives to you damaged, but the customer is responsible for returning all product and filing any damage claims on returned product, which does not arrive back to UP in new condition. No returns after 30 days. Still have questions? Please Ask!